Chase works at Walgreens, where he often mans the Photo Center. Just look at that smile! This is my boy Chase and today is Chase day. I’m not as consistent with my Family Days idea as I would like to be, but I am grateful for the self-imposed deadline that gives me the opportunity a few times a month to hop on my blog and extol some virtue or another about my family members. Even inconsistently I am telling our stories! Chase is currently off-track in his studies at BYU-Idaho, which means he is home working at Walgreens. While he doesn’t love this job, he is very good at it. At dinner a few nights ago he read us the customer feedback that was posted in the employee area. FYI: Apparently your local Walgreens store receives something called the Daily Praise Report and when feedback is shared online that is linked to a particular store, it is forwarded to the store manager. 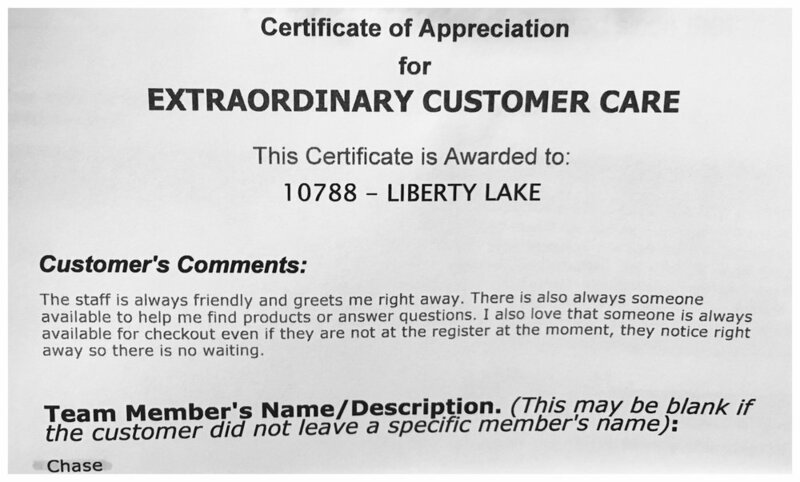 These “Certificate of Appreciation for Extraordinary Customer Service” emails allow the manager to see specific feedback from customers shopping in their store. Sometimes a particular employee is mentioned. So, Chase says, “Do you guys want to hear what somebody said about me, that Jamie (the manager) hung in the break room?” He proceeds to read this first certificate. Then he begins to read another comment. I ask, “Where did you get this one?” Chase explains, “Oh, well when Jamie hung up the new comment, she took down the old one—that was about me too!” He mentioned later (as if it was no big deal) that his store manager told him that 90% of the positive feedback is about him. NINETY PERCENT. Chase most definitely has his struggles. In the second comment you’ll read that he forgot to give this customer their change, but HE IS SO NICE AND POLITE that the customer did not mind. Seriously!? This is what continues to astound me as a mother. I am often stuck in the mode of noticing all the little things that Chase doesn’t do. How he doesn’t follow through or remember or pick up or write something down or WHATEVER it is, but what this customer experienced is exactly what I also experience on a daily basis. Chase is kind, patient, forgiving, etc.. He takes my endless correction in such a sweet and mild manner. He is the personification of the biblical term, “without guile” and I am so grateful for his influence in my life. I’m particularly grateful this week for the reminder that I CAN CHOOSE what to focus on. I can focus on the scarcity I find in Chase or I can focus on the abundance.